A gentleman should remove his hat upon entering the auditorium. When visiting a strange church, you should wait in the vestibule until an usher appears to show you to a seat. A gentleman may walk up the aisle either a little ahead of, or by the side of a lady, allowing the lady to first enter the pew. There should be no haste in passing up the aisle. People should preserve the utmost silence and decorum in church, and avoid whispering, laughing, staring, or making a noise of any kind with the feet or hands. It is ill-mannered to be late at church. If one is unavoidably late, it is better to take a pew as near the door as possible. Ladies always take the inside seats, and gentlemen the outside or head of the pew. When a gentleman accompanies a lady, however, it is customary for him to sit by her side during church services. A person should never leave church until the services are over, except in some case of emergency. Do not turn around in your seat to gaze at anyone, to watch the choir, to look over the congregation or to see the cause of any disturbing noise. If books or fans are passed in church, let them be offered and accepted or refused with a silent gesture of the head. It is courteous to see that strangers are provided with books; and if the service is strange to them, the places for the day’s reading should be indicated. It is perfectly proper to offer to share the prayer-book or hymn-book with a stranger if there is no separate book for his use. 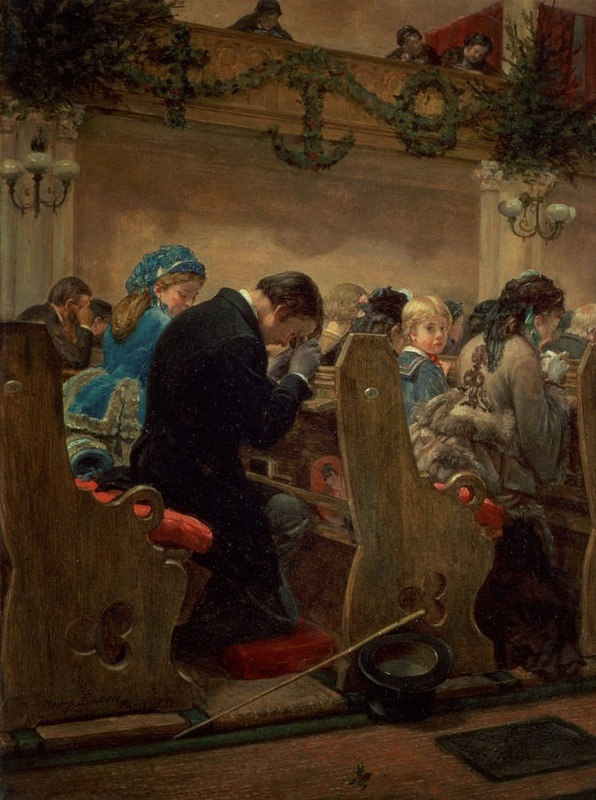 In visiting a church of a different belief from your own, pay the utmost respect to the services and conform in all things to the observances of the church—that is, kneel, sit and rise with the congregation. No matter how grotesquely some of the forms and observances may strike you, let no smile or contemptuous remark indicate the fact while in the church. When the services are concluded, there should be no haste in crowding up the aisle, but the departure should be conducted quietly and decorously. When the vestibule is reached, it is allowable to exchange greetings with friends, but here there should be no loud talking nor boisterous laughter. Neither should gentlemen congregate in knots in the vestibule or upon the steps of the church and compel ladies to run the gauntlet of their eyes and tongues. If a Protestant gentleman accompanies a lady who is a Roman Catholic to her own church, it is an act of courtesy to offer the holy water. This he must do with the ungloved right hand. In visiting a church for the mere purpose of seeing the edifice, one should always go at a time when there are no services being held. If people are even then found at their devotions, as is apt to be the case in Roman Catholic churches especially, the demeanor of the visitor should be respectful and subdued and his voice low, so that he may not disturb them. On entering the hall, theater or opera house the gentleman should walk side by side with his companion unless the aisle is too narrow, in which case he should precede her. Upon reaching the seats, he should allow her to take the inner one, assuming the outer one himself. A gentleman should, on no account, leave the lady’s side from the beginning to the close of the performance. If it is a promenade concert or opera, the lady may be invited to promenade during the intermission. If she declines, the gentleman must retain his position by her side. There is no obligation whatever upon a gentleman to give up his seat to a lady. On the contrary, his duty is solely to the lady whom he accompanies. He must remain beside her during the evening to converse with her between the acts, and to render the entertainment as agreeable to her as possible. During the performance complete quiet should be preserved, that the audience may not be prevented from seeing or hearing. Between the acts it is perfectly proper to converse, but it should be done in a low tone, so as not to attract attention. Neither should one whisper. There should be no loud talking, boisterous laughter, violent gestures, lover-like demonstrations or anything in manners or speech to attract the attention of others. It is proper and desirable that the actors be applauded when they deserve it. It is their only means of knowing whether they are giving satisfaction. The gentleman should see that the lady is provided with a programme, and with libretto also if they are attending opera. In passing out at the close of the performance the gentleman should precede the lady, and there should be no crowding or pushing. If the means of the gentleman warrant him in so doing, he should call for his companion in a carriage. This is especially necessary if the evening is stormy. He should call sufficiently early to allow them to reach their destination before the performance commences.It is unjust to the whole audience to come in late and make a disturbance in obtaining seats. The gentleman should ask permission to call upon the lady the following day, which permission she should grant; and if she be a person of delicacy and tact, she will make him feel that he has conferred a real pleasure upon her by his invitation. Even if she finds occasion for criticism in the performance, she should be lenient in this respect, and seek for points to praise instead, that he may not feel regret at taking her to an entertainment which has proved unworthy. In visiting picture-galleries one should always maintain the deportment of a gentleman or a lady. Make no loud comments and do not seek to show superior knowledge in art matters by gratuitous criticism. If you have not an art education you will probably only be giving publicity to your own ignorance. Do not stand in conversation before a picture, and thus obstruct the view of others who wish to see rather than talk. If you wish to converse with any anyone on general subjects, draw to one side, out of the way of those who want to look at the pictures. In visiting a fancy fair make no comments on either the article or their price, unless you can praise. If you want them, pay the price demanded, or let them alone. If you can conscientiously praise an article, by all means do so, as you may be giving pleasure to the maker if she chances to be within hearing. If you have a table at a fair, use no unladylike means to obtain buyers. Not even the demands of charity can justify you in importuning others to purchase articles against their own judgment or beyond their means. Never appear so beggarly as to retain the change, if a larger amount is presented than the price. Offer the change promptly, when the gentleman will be at liberty to donate it if he thinks best, and you may accept it with thanks. He is, however, under no obligation whatever to make such donation. Be guilty of no loud talking or laughing, and by all means avoid conspicuous flirting in so public a place. As a gentleman must always remove his hat in the presence of ladies, so he should remain with head uncovered, carrying his hat in his hand, in a public place of this character. If you have occasion to visit an artist’s studio, by no means meddle with anything in the room. Reverse no picture which stands or hangs with face to the wall; open no portfolio without permission, and do not alter by a single touch any lay-figure or its drapery, piece of furniture or article of vertu posed as a model. You do not know with what care the artist may have arranged these things, nor what trouble the disarrangement may cost him. Use no strong expression either of delight or disapprobation at anything presented for your inspection. If a picture or a statue please you, show your approval and appreciation by close attention, and a few quiet, well chosen words, rather than by extravagant praise. Do not ask the artist his prices unless you really intend to become a purchaser; and in this case it is best to attentively observe his works, make your choice, and trust the negotiation to a third person or to a written correspondence with the artist after the visit is concluded. You may express your desire for the work and obtain the refusal of it from the artist. If you desire to conclude the bargain at once you may ask his price, and if he names a higher one than you wish to give, you may say as much and mention the sum you are willing to pay, when it will be optional with the artist to maintain his first price or accept your offer. It is not proper to visit the studio of an artist except by special invitation or permission, and at an appointed time, for you cannot estimate how much you may disturb him at his work. The hours of daylight are all golden to him; and steadiness of hand in manipulating a pencil is sometimes only acquired each day after hours of practice, and may be instantly lost on the irruption and consequent interruption of visitors. Never take a young child to a studio, for it may do much mischief in spite of the most careful watching. At any rate, the juvenile visitor will try the artist’s temper and nerves by keeping him in a constant state of apprehension. If you have engaged to sit for your portrait never keep the artist waiting one moment beyond the appointed time. If you do so you should in justice pay for the time you make him lose. A visitor should never stand behind an artist and watch him at his work; for if he be a man of nervous temperament it will be likely to disturb him greatly.